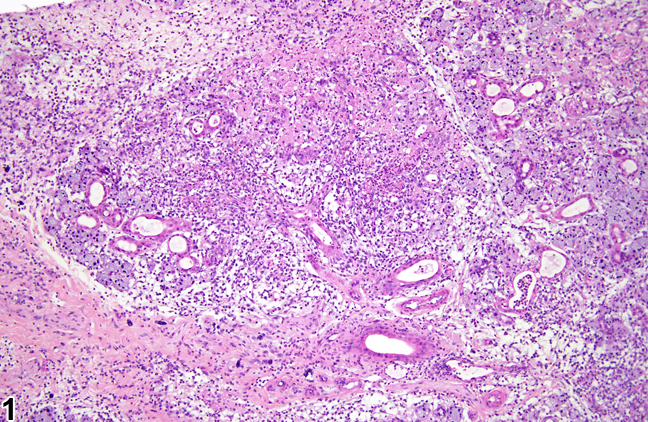 Salivary gland - Necrosis in a male F344/N rat from a subchronic study. 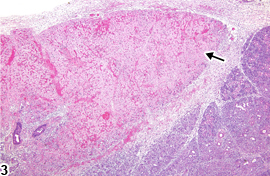 There is necrosis of the acinar cells (arrow) with inflammation. Salivary gland - Necrosis in a male F344/N rat from a subchronic study. 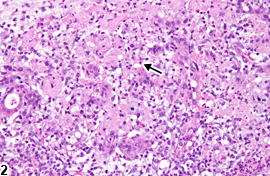 There is necrosis of the acinar cells (arrow) with chronic active inflammation. Salivary gland - Necrosis in a female F344/N rat from a subchronic study. 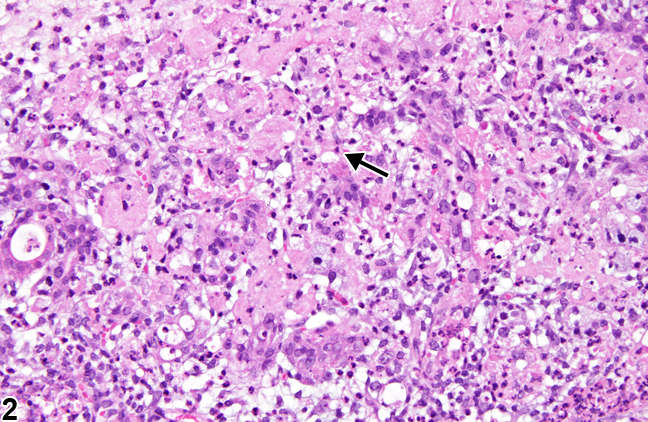 There is necrosis of an entire lobe of the salivary gland (arrow), consistent with an infarct. Salivary gland - Necrosis in a female F344/N rat from a subchronic study. 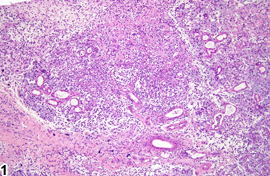 There is necrosis of all the components of the salivary gland (consistent with an infarct), with inflammatory cells, mostly neutrophils. 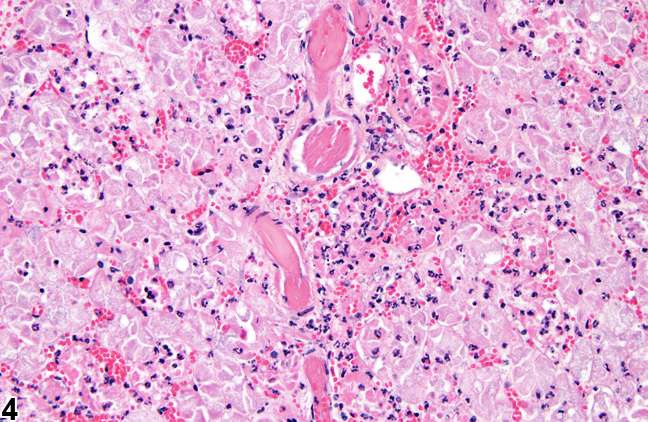 Necrosis may be characterized either by scattered single-cell necrosis or by locally extensive areas of necrosis involving contiguous cells or structures. Single-cell necrosis can present as cell shrinkage, condensation of nuclear chromatin and cytoplasm, convolution of the cell, and the presence of apoptotic bodies. 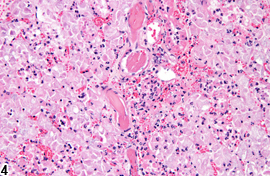 Acinar necrosis can present as focal to multifocal areas characterized by tissue that is paler than the surrounding viable tissue, consisting of swollen cells with variable degrees of eosinophilia, hyalinized cytoplasm, vacuolated cytoplasm, nuclear pyknosis, karyolysis, and/or karyorrhexis with associated cellular debris ( Figure 1 and Figure 2 ). Secondary inflammation is common. Infarction ( Figure 3 and Figure 4 ) is characterized by a focal to focally extensive area of salivary gland necrosis. 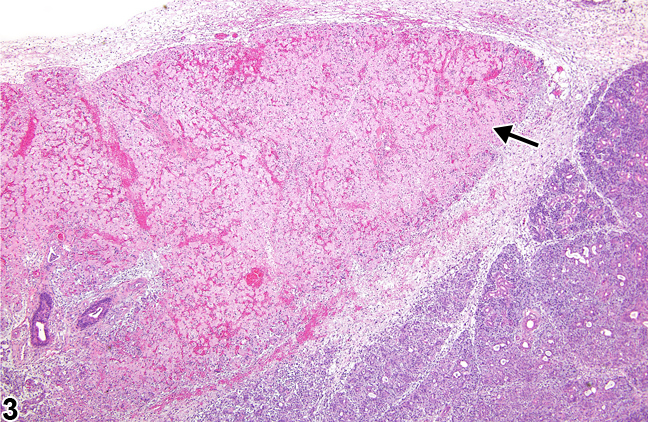 One cause of necrosis, inflammation, and atrophy of the salivary gland in the rat is an active sialodacryoadenitis virus infection, but this virus does not affect the mouse salivary gland. Whenever present, necrosis should be diagnosed and graded based on the extent of the necrosis. Secondary lesions, such as inflammation or hemorrhage, are not diagnosed separately unless warranted by severity. Infarcts should be diagnosed as necrosis, but the pathology narrative should state that the lesion is consistent with an infarct.